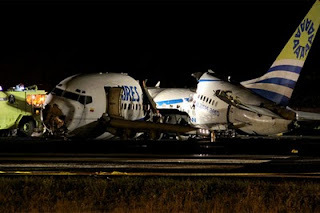 16 August 2010; Aires Colombia; 737-700; HK-4682; San Andres Island, Colombia: The airliner was on a scheduled domestic flight from Bogota to San Andreas Island, Colombia. San Andreas Island lies off the east coast of Nicaragua. The aircraft took off from Bogota just after midnight and was attempting to land just before 2 a.m. local time during a storm. The aircraft was reportedly struck by lightning just before touchdown. The airplane struck the runway and broke up into three large pieces. One of the 125 passengers was killed, and all six crew members survived. This was the third fatal crash involving Aires Colombia. Their two previous fatal crashes were in 1995 and 1985 and both involved Embraer Bandierante aircraft. This was the 70th crash of a 737 that resulted in the death of at least one airline passenger. This is the sixth fatal plane crash involving one of the current production models of the 737 (737-600, 737-700, 737-800, and 737-900). All five previous fatal crashes involved the 737-800 model. The 737-700 had been involved in one previous fatal incident. In December 2005, a Southwest Airlines 737-700 ran off the runway at Midway Airport in Chicago and struck a car on a nearby road, which led to the death of one of the passengers in the car. Did he have weather radar? Was it working? Was it on? Was the pilot trying to stay AT LEAST 5NM from all thunderstorms shown on the radar? Was the storm reported by the met office or by ATC? This sounds like one more stupid pilot trying to land or takeoff in a thunderstorm!